The Hawaii congresswoman braved wintry conditions on her first visit to the Hawkeye State since announcing her presidential candidacy. FAIRFIELD, Iowa — With a familiar greeting, voters welcomed U.S. Rep. Tulsi Gabbard to the snowy plains of Iowa on Monday as a 2020 presidential contender. The salutation came from a crowd of nearly 100 people who had gathered here for the Hawaii congresswoman’s first visit to the Hawkeye State since she officially announced her candidacy on the beaches of Waikiki last month. 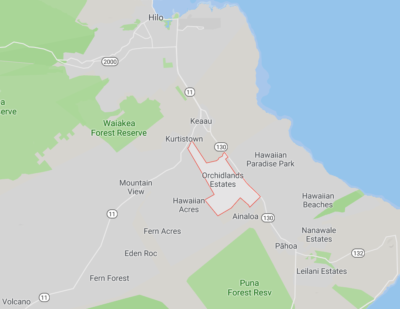 While Gabbard’s candidacy has been greeted with skepticism both at home in Hawaii and in Washington, she was received by a friendly crowd, one that was made up largely of people affiliated with the Maharishi University of Management and Transcendental Meditation. 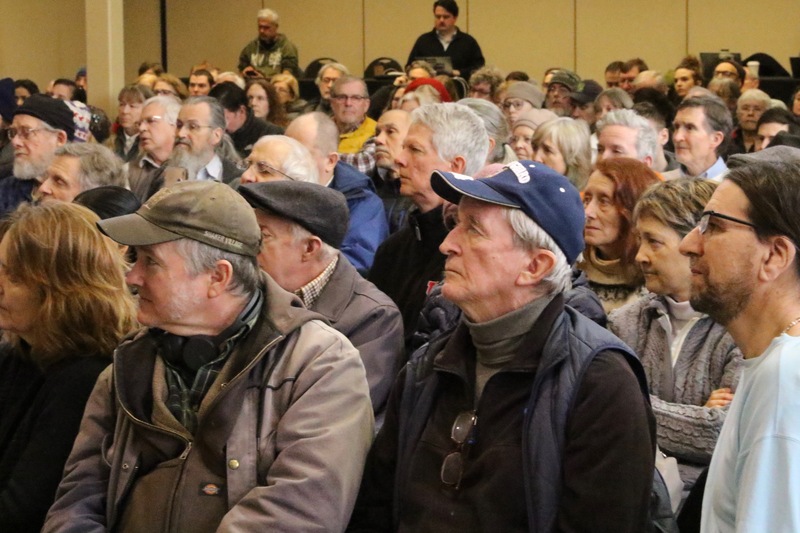 Audience members gathered at a community center in Fairfield, Iowa, to listen to Hawaii Congresswoman Tulsi Gabbard speak about her presidential ambitions. Fairfield, after all, is the American epicenter of the meditation practice, and has a global following that’s garnered praise and attention from across the globe, including from celebrities Jim Carrey, the Beach Boys and Oprah Winfrey. Tom Kroupa, who lives here, was among the eager Gabbard supporters. He said her message, one that hinges on bringing an end to American regime-change wars that drain the U.S. treasury and benefit conflict profiteers and the politicians they support, resonates with him more than other candidates. 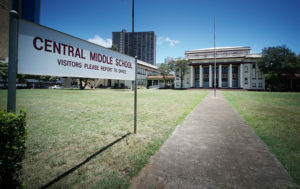 Her message of aloha is tinged with talk about the threats of nuclear warfare, and she often discusses the false missile alert in Hawaii that sent shockwaves of dread through the islands’ population. Gabbard talked to a crowd in Fairfield, Iowa, largely affiliated with the Maharishi University of Management and Transcendental Meditation. Another highlight of her stump speech is the need to get corporate money out of politics, whether it’s coming from pharmaceutical companies or defense contractors. In a brief interview with Civil Beat at the Fairfield event, Gabbard brushed off the criticisms of her campaign so far, and said she plans to hone in on the work she’s doing in Iowa and other states that could give her a boost in national recognition. 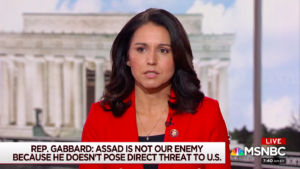 In the email, Gabbard assailed the media and insinuated that she was the victim of a corporate conspiracy to somehow silence her views on war and anti-interventionist foreign policy. 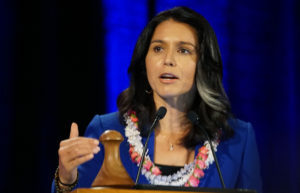 “Today, our freedoms and democracy are being threatened by media giants ruled by corporate interests who are in the pocket of the establishment war machine,” Gabbard said. The email — which included a series of “Donate” buttons — was no doubt aimed at NBC News, which published a story Feb. 2 that highlighted how various websites and social media accounts affiliated with Russian propaganda during the 2016 presidential election seemed to be supporting Gabbard. NBC News has stood by the story and no corrections or retractions have been issued. 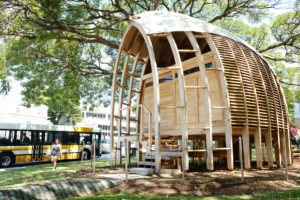 The NBC News piece dropped the same day Gabbard held her official campaign kickoff on the great lawn at the Hilton Hawaiian Village in Waikiki. 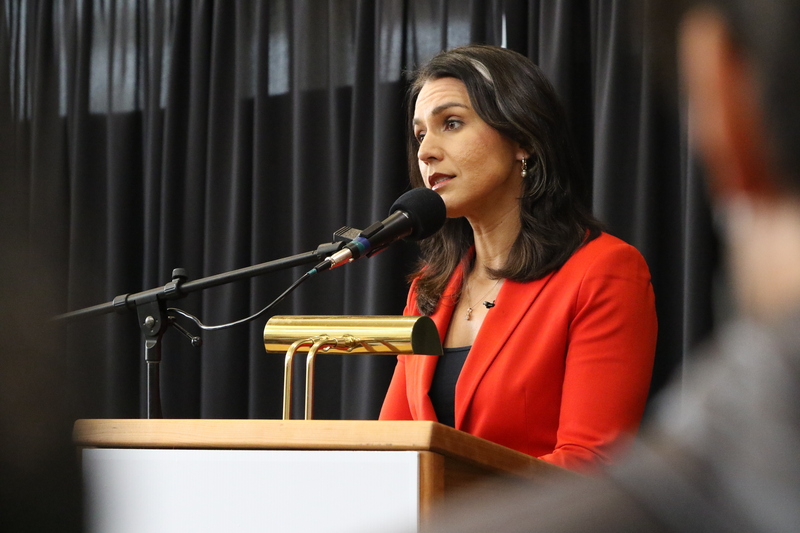 Gabbard refused to back off of her attacks on the NBC News piece Monday, pointing again to the concerns raised by journalist Glenn Greenwald of The Intercept. 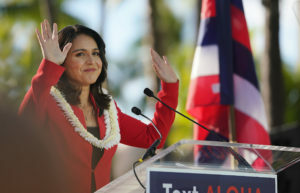 “People are frustrated by the fact that there are some people who may call themselves journalists, but who are not putting out a message that is based on fact or reality,” Gabbard said. Gabbard’s swing through Iowa started with a hiccup. Her flight from Chicago to Des Moines was cancelled due to the poor weather, which forced her to drive the 300-plus mile distance in a Suburban. 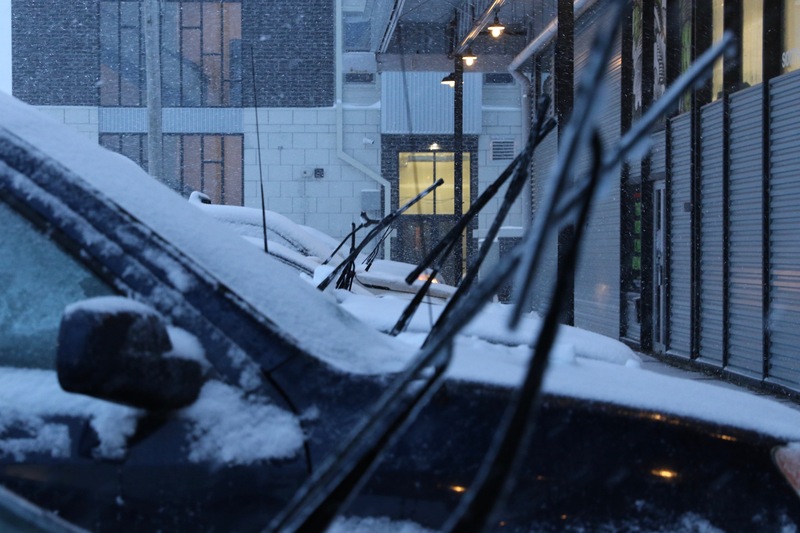 Patrons of a local brewery in Iowa City where Tulsi Gabbard was set to speak prepared for the oncoming weather by raising their windshield wipers. The delay caused her to miss her opening event Sunday evening that was hosted by the Asian Latino Coalition. Instead, she held a 7:30 a.m. meet and greet Monday morning with about two dozen people at the Hampton Inn in downtown Des Moines before leaving for Fairfield. Nearly half of the Des Moines attendees were members of the media. Gabbard took audience questions at the event, including one about her stand on The Green New Deal, an environmental resolution backed by the new progressive wing of the Democratic Party led by U.S. Rep. Alexandria Ocasio-Cortez. Gabbard, who’s displayed an environmentalist bent during the course of her political career, was not a co-sponsor of the legislation. 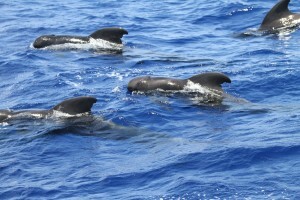 The only member of Hawaii’s delegation to sign on at the outset was U.S. Sen. Mazie Hirono. Gabbard said she was still “reviewing” the 14-page Green New Deal resolution, saying in general that it had positive attributes, but was still vague on the details. She did not address what specific concerns she had about those issues. Gabbard additionally expressed skepticism about the federal jobs guarantee included in the nonbinding resolution, which signifies only what direction the party wants the country to go and doesn’t carry the weight of law. “The idea of creating make-work jobs in the federal government is something that I think is a problematic concept that’s proven to have failed in other countries,” Gabbard said. One idea she’s considering, she said, is a universal basic income, although she didn’t go into any detail. 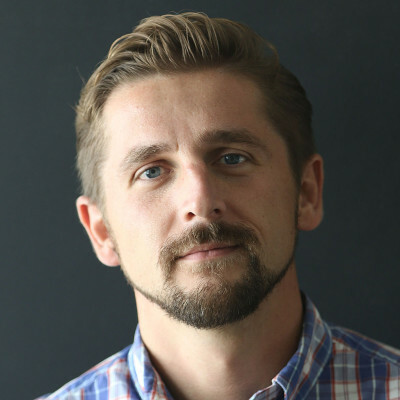 It’s not the first time Iowans — or anyone else paying close attention to the 2020 presidential primaries — would have heard a candidate talking about a universal basic income. For Prakash Kopparapu, chairman of the Asian Latino Coalition, the fact that Gabbard is toying with the idea of supporting a universal basic income is good, but she needs to develop a policy of her own as the campaign wears on. “She has great ideas and I think she’s ready to go, but most of the topics we discussed are all common talking points,” Kopparapu said. Many of the Democrats in the field already say they support some form of Medicare for all or openly criticize the way the American immigration system is set up and run. When Gabbard says the same, Kopparapu said, it’s met with a shrug. 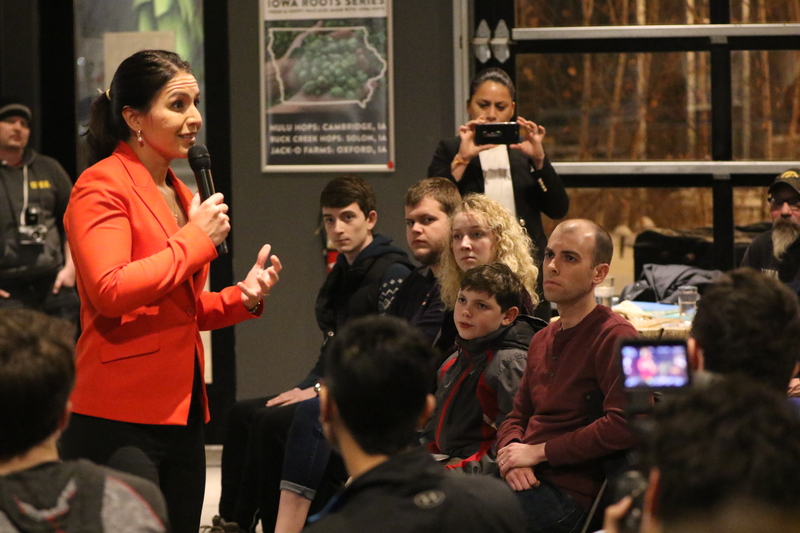 Gabbard’s final stop Monday was in Iowa City, where she greeted a small crowd that braved snow and icy conditions to hear her pitch her brand of aloha. She fielded a handful of questions, including whether she’d team up with U.S. Sen. Bernie Sanders, of Vermont, should he enter the race. Gabbard does well with Sanders supporters, especially after she quit the Democratic National Committee to support his 2016 bid for president. The congresswoman’s answer, however, was noncommittal. She said she had talked to him about her own run, but that she didn’t know what his plans were. 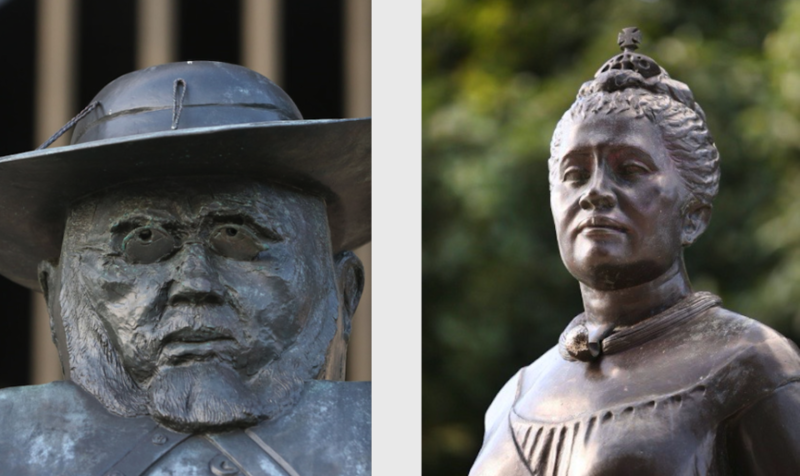 She noted that both were still “deeply committed” to their cause. U.S. Rep. Tulsi Gabbard, a Hindu, told the audience in Iowa City that she had been a victim of religious bigotry — a theme that has been central to her young campaign. One of the most difficult questions Gabbard fielded all day came from Mazahir Salih, a city councilor from Iowa City. Salih is the first Sudanese-American to hold elected office in the U.S., and a Muslim. She said she recently read an article that raised questions about whether Gabbard was Islamaphobic, something Salih acknowledged would seem out of character. Still, Salih said, she wanted to know for sure. She joked that if it were true, she’d no longer want to take a photo with the congresswoman. “Do you have Islamaphobia?” she asked. “You know the answer to this question,” Gabbard replied. “I want to hear it from you,” Salih said. “The answer is no,” Gabbard said. Gabbard, a Hindu, said she had been the victim of religious bigotry and that it was up to people to stand up and condemn it. Salih, happy with the answer, then stood in line to get have her photo taken with Gabbard, a moment she said the two had shared before.